Anvik had a big kashim [ceremonial house]…the place where they dance. We’ve got one up there now too that we use. Communities along the lower Yukon River held winter ceremonies to communicate with the spirits of their world. The Deg Hit’an are the only Athabascans with a tradition of masked dancing, which continues in modern form. This late 19th century mask is a face within a face; the outer one a black raven, the inner one a person-like spirit or owl. Phillip Arrow: This one look like owl style, you know how owl look? 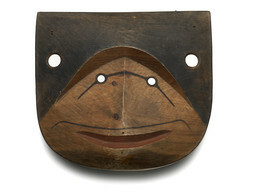 Phillip Arrow: The one [mask] I make is down little ways right here [top]. . . . This one it’s either a crow—anyway, they make all kinds of masks long ago. Phillip Arrow: This [top center] one is feathers right here. Trimble Gilbert: Yes, lots of holes, small ones, at top. Eliza Jones: Place for feathers in the center. Phillip Arrow: . . . It sure look like owl to me though. They make all kinds of crow masks too. But I don’t know what’s this. Eliza Jones: This has holes up above the eye too, this side . . . and this side too. So there was something attached to it. Phillip Arrow: Maybe feathers again. Judy Woods: More feathers, I think. At the mouth too. . . . Maybe that’s supposed to be a crow? Phillip Arrow: Must be. There’s all kinds of way they make crow masks. Trimble Gilbert: You guys have a crow or raven? Eliza Jones: Dotson’ [raven] looks like. Trimble Gilbert: Yes, we call deetryą‘ [raven]. Judy Woods: We call it dotson’. Phillip Arrow: Yuxgitsiy [raven]. . . . Dalnedh [great horned owl], that’s that other word. Eliza Jones: Oh, what’s that? Trimble Gilbert: Different kinds of owl, too. Eliza Jones: We say negoodzeghe [great horned owl] for owl.